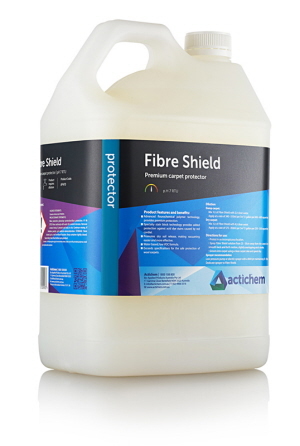 Actichem carpet protectors ensure that your clean carpet, stays clean and free of stains, dirt and mould. The most advanced and up-to-date chemistry in carpet and fabric protection gives Actichem complete confidence in a range of protectors, developed by the leaders in fibre protection technology. It has stain blockers which provides added protection against acid dye stains caused by red cordial spills. It promotes effective dry soil release making vacuuming easy and effective. Available in 1, 5 and 20 litres. Actichem Fabric Shield RTU is an advanced water based fluorochemical fabric protector provides premium protection against water based stains, oil based stains and general grime. In a ready to use, spray and go bottle mainly for doing soft burnishings. It has specialty stain blockers provide added protection against acid dye stains caused by red cordial spills. It makes routine upholstery cleaning by wet extraction significantly more successful as the soiling is released quicker and easier. Protects against food & beverage spills and hair & body oils. It makes upholstery cleaning easier by wet extraction significantly more successful as the soiling is released quicker and easier. It is perfect to use on domestic and commercial upholstery, drapes and table cloths. Use Fabric Shield SV for dry clean only fabrics. Available in 1, 5 and 20 litres. The Canyon triggers link below are suitable to screw directly into the 1 litre bottle. 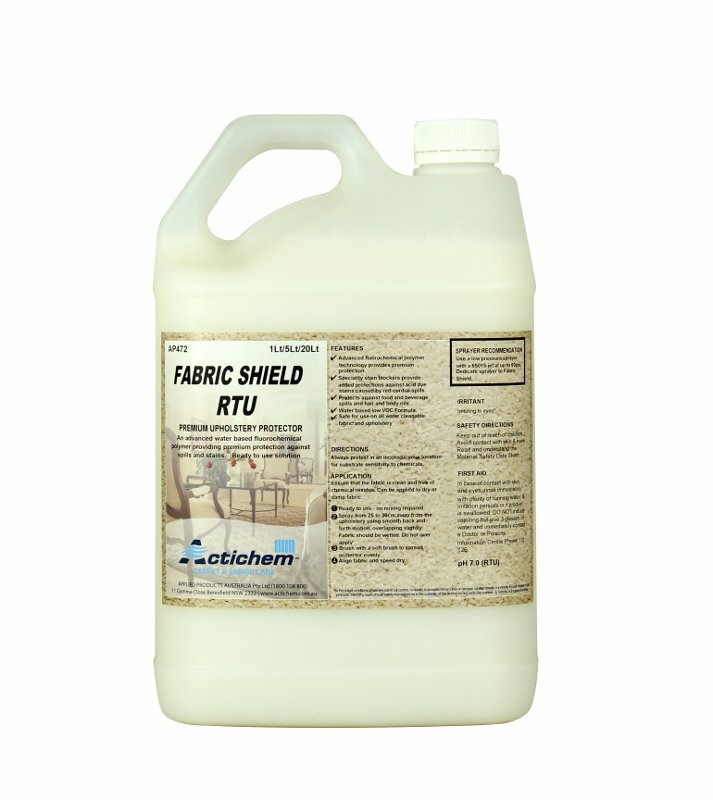 It has been professionally formulated to create a durable, highly repellent property to each fibre which holds spills and stains at the surface and enables them to be removed before causing permanent staining. It has an excellent beading effect for easy and effective removal of spills. It does not alter the feel of the fabric when applied as directed. It is effective on most delicate natural and synthetic fabric and leather. It is perfect for use on all fabrics, garments, drapes, table cloths and upholstery. Available in 1, 5, and 20 litres.